Step is a full-body cardio workout to tone your legs in a different way. 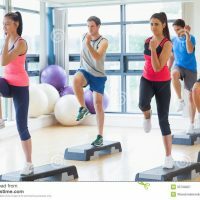 It consists of simple, heart-pumping step aerobics routines combined with strength training intervals to give you a complete cardio and weights workout. This is an excellent cross-training class for ALL skill and fitness levels. You may be surprised to actually enjoy sculpting your body and following step combinations. WHEN: Tuesdays 6:00 – 7:00P.M. or $8 per drop in at the door.